A continuous increase in the genomic data has led to the implementation of computational approaches to store, analyze, annotate, and derive the meaningful interpretation of data. This demands the need for proper databases to submit, store, edit, and update the large-scale data. One of the crucial requirements of biological databases is to provide updated high-quality data collection. Over the years, publicly available data repositories and resources have been advanced to save and cope with the staggering extent of records. Also, database a computerized archive is used to store and prepare records in such a way that the data can be retrieved effortlessly through a ramification of search criteria. A large number of databases are available that offer precious record assets for various biological researches. In general biological databases are categorized into primary, secondary, and specialized databases. As of today, there are many databases which host the specific information about particular genes and proteins from diversified biological sources like humans, animals, plants, and microbes. These databases are continuously being enriched and updated with the latest research information generated by cutting-edge biotechnological methods. All these databases act as useful platforms in extracting, analyzing, and interpreting the multidimensional molecular information. Various computer-based programs and webtools including BLAST, FASTA, Entrez, MAGE, Chime, RasMol, CASP, CAFASPI, PDB3D browse, GCG, etc. 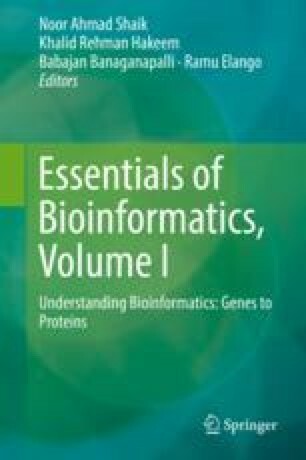 are being used widely for algorithmic analysis, modeling, and data visualization of the databases on genomics and proteomics.